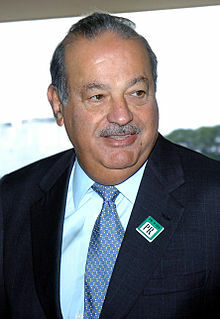 Carlos Slim Helú (born January 28, 1940 in Mexico City) is a Mexican businessman. He was the wealthiest person in the world from 2010 to 2013. He owns the Mexican phone company Telmex, which provides a telephone service to most Mexicans. After graduating, Slim expanded on his father's ownings of real estate in Mexico City. By age 26, he was worth $40 million. During the 1980s and 1990s, Slim bought several companies that were bankrupt or being privatized. Slim owns about 7% of the New York Times. He is now worth $60 billion. Slim's maternal grandparents and his father were from Lebanon. In 2017, According to Forbes Carlos Slim is the world’s fifth richest person. ↑ "Carlos Slim Helu & family". Forbes. Retrieved March 8, 2011. ↑ Bone, James (March 11, 2010). "Mexican mogul Carlos Slim got his big break in sell-off of national telephone firm". The Times (London). http://business.timesonline.co.uk/tol/business/entrepreneur/article7057516.ece. Retrieved June 17, 2011. ↑ Padgett, Tim (July 11, 2007). "Carlos Slim's Embarrassment of Riches". Time Magazine (United States). http://www.time.com/time/business/article/0,8599,1642286,00.html. Retrieved June 17, 2011. ↑ Allentuck, Andrew (March 2009). "Carlos Slim Helu". Trade by Numbers. globeinvestor.com. Retrieved May 26, 2012. ↑ "When the World's Richest Billionaire Owns Your Paper". FAIR. 2013-11-01. Retrieved 2018-07-16. ↑ "Profile: Carlos Slim". BBC News. March 10, 2010. Retrieved April 28, 2010. ↑ "Forbes". Forbes. Retrieved 2018-07-16. This page was last changed on 16 July 2018, at 05:48.